For breakfast I had a green mango smoothie. I used to eat mangoes all the time and I wanted to rekindle my love with them this week. So good! This smoothie was bananas, spinach, coconut water, and mango. It was a perfect way to start off the morning. I usually do just banana and spinach smoothies but the mango was a great thing to add for a change! I was so excited for lunch today! 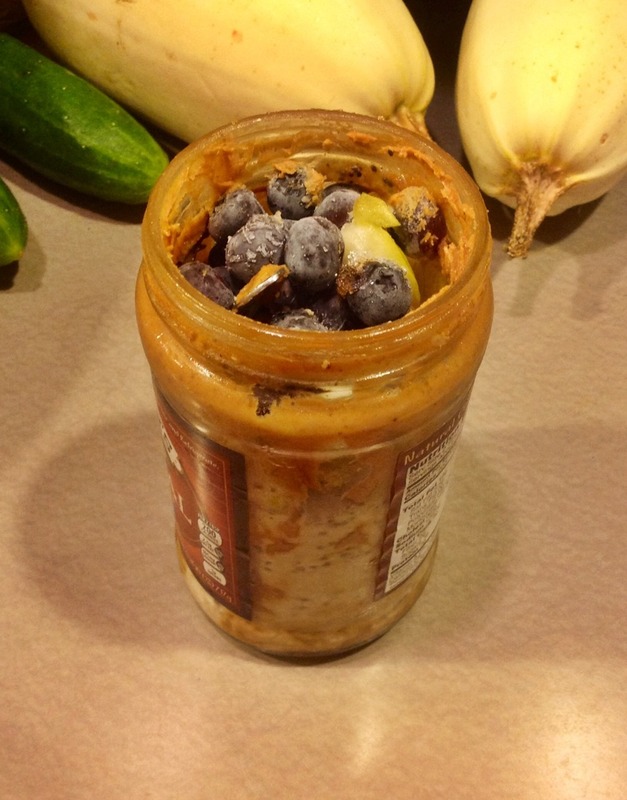 Any time that I finish a jar of peanut butter that means one thing... overnight oats! I love having a bit of left over peanut butter in the jar for the oats. I mixed 1/2 cup oats with 1 cup of almond milk and some chia seeds, let it in the fridge overnight and then added blueberries and a pear to it this morning before I left for work. The easiest lunch ever! This jar is tall enough that I'm able to fit a spoon inside of it so I just screw the lid on and it's ready to go. The best. I did eat non gluten free oats a few days just out of curiosity to see if they would bother me. They did. I didn't feel so great after eating them. I was interested to see how it would go though. I've been trying to experiment with food more to make it fun. This was a learning experience and it's back to gluten free oats for me! I love Trader Joe's dried mango more than any other dried fruits ever. I don't live near a Trader Joe's so when I go I stock up on packs of these. The cashiers probably think I'm crazy. Crazy in love with this mango. Yes. I love that it's just mango, no additives like most dried fruits that I find. I ate about half of a pack today as a snack. It's addictive! And so good. That's it for today guys! What did you have to eat today? Let me know! I'd love to hear from you.